The second half of your weekly dose of goodness is late again, but now that Dave is getting a good night’s sleep, we should finally be back on a Monday/Tuesday release schedule again starting next week. This week, we talk about fall shows we’re looking forward to and pilots for the shows Bionic Woman, Reaper and Terminator: The Sarah Connor Chronicles. This week we talk about the Natural Born Killers of the 70’s, Badlands. This is usually where I would tell you that it’s a cool dvd, but the features are pretty sad, actually. Enjoy the show! Our own Marty McFly (Barry’s brother) has taken the plunge and decided to make his own honest-to-goodness movie. It’s been in production for a few weeks now and he’s put together a trailer. This looks to be really interesting. I won’t spoil any of the story as it sounds really cool and would be fun to see if people get. Anyway, check it out! It’s finally here after a long delay. Again, I apologize for this being late. Even moreso, I have to apologize to the ever faithful Ethan. The show was running so long that we had to cut the listener mail segment, but his voicemail WILL be heard in next week’s episode. This week, Chris Stipp from Quick Stop Entertainment joins us to talk about the summer of 2007. The bad, the ugly and the good (hey, we wanted to end on a high note!) are all exposed this episode. I promise that SG Episode 13 is uploading as I type this, but until then, here’s the newest ScreenGeeks Film Snob. This week, we talk about the astounding Contempt from Jean-Luc Goddard. Barry thanked me for exposing him to Sullivan’s Travels, and now it’s my turn to thank him. You can find out further details on the Criterion edition of Contempt at their official site. Sorry I didn’t get this up sooner. We had an amazing show with Chris Stipp from Quick Stop Entertainment and I used some new software to record the show. The problem is I had the sound board too quiet so I’m having to do a lot more work in post-production. Be prepared for a little sketchy sound quality, but it should be up tonight along with our latest Film Snob where we talk about the great Goddard film, Contempt. Update: The show did not get put up last night, obviously. I have completed the editing and just have to drop a couple things in post. It WILL be up tonight along with our Contempt Film Snob. I apologize for the huge delay this week. To say that life has been interesting is an understatement. I won’t be able to talk about it until next week, but I will post about it probably around Wednesday or Thursday. Due to some technical issues (my e-mail freaking out and having to be recreated entirely), this review comes a bit late, and I apologize. Ethan is back again with a brand new inven…never mind. Let’s get to his look at the new Coen Brothers film. 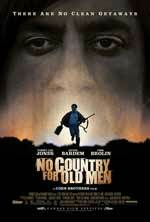 I will will start this review with a bold statement : Javier Bardem WILL win a Best Supporting Actor Oscar for this. I guarantee it. Now onto the movie. No Country For Old Men is brilliant. Freakin’ brilliant. The Coens brothers take what could be an average thriller and turn it into an examination of the moral values and society of this day and age. These aren’t blatantly on the surface. But even if you don’t get the themes, you’ll still probably wind up enjoying the movie. From the masterful suspense and stunning cinematography, No Country For Old Men gets it all right. It also features more humor than I expected. Which is a good thing. It prevents it from getting too bogged down in it’s darkness. This week, we discuss Preson Sturges’ glorious Sullivan’s Travels. There is also complete info about the disc and a great essay about the film on the official Criterion Collection website. I apologize to all who may have e-mailed me and not recieved a response or got an error back. Apparently, my e-mail is possessed, so I’m nuking the whole thing and recreating my account. I should be up in about an hour or so, just in case anybody cares.